Audition concerts for a new artistic director/conductor are a challenge…One kick at the can and that’s it. Last evening the H.P.O.’s podium guest was Alain Trudel. This writer has had previous opportunities to see & hear Trudel; twice with the HPO, first in ’05 and then twice in 2011 including a National Academy Orchestra concert. To Hamilton audiences, the other four applicants are known strictly by reputation but possess commanding resumes. A tough decision faces the selection committee. The focus of Trudel’s selection was three interpretive variations of the Romeo and Juliet story. The opening work was the familiar fantasy overture composed by Tchaikovsky. The reading was dramatically emphasized by slower tempi and meticulous accentuation. This writer owns about five versions of the work but Trudel’s conception was unique and certainly courageous given the circumstances. Berlioz’ take on the story comprised five movements iterating the progress of the plot to its inevitable doomed ending. The 2nd movement – ‘love theme’ was the performed selection and it offered a vibrantly visual as well as aural attention to the orchestra. Each section performed impeccably, especially the winds. 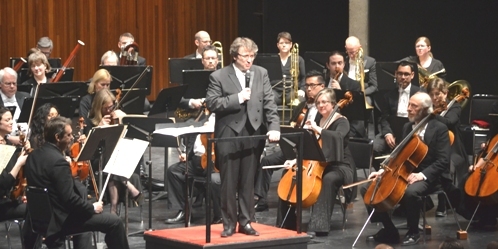 Trudel demonstrates a totally immersed involvement with his musicians as well as the music being performed, the HPO members responded in kind. Post interval, the most contemporary adaptation. Prokofiev’s ballet was first performed just before the start of WWII. Trudel’s commentary was both erudite and vocally elocuted. Trudel selected six selections from the Suite No. 1 and the final two from Prokofiev’s 2nd – the dance of the Girls with lilies and ‘Romeo at Juliet’s grave’. The dramatic crescendo that closes the ‘Death of Tybalt’ is so emotional that the spontaneous applause by the Great Hall audience was agreeably acknowledged by the conductor. The conflicting themes, trills; Om pah pahs; dirges and nursery rhyme melodies and Welk-like bubbles afford the musicians occasions to shine and the unaccompanied sectional instances allocated to the brasses; winds and especially the intense percussion moments all showcased the potential that is the HPO. Trudel’s demeanor with the audience as well as the musicians is something that the selection committee must certainly consider. Even his approach to the podium; through rather than in front of the orchestra demonstrates his feeling of being part of rather than superior to his instrumentalists. Vigilant readers may have gleaned that yours truly has eliminated two contestants; now it is in the hands of the ‘powers-that-be’. Hopefully one of my choice –three!